Veteran Los Angeles artist Tony Berlant opens an exhibition at Brian Gross Fine Art on Thursday, May 7 with an opening reception from 5:30–7:30pm. On display will be a selection of Berlant’s works from 2006–2009, with a focus on more recent abstractions and new house box sculptures. The exhibition continues through June 27. 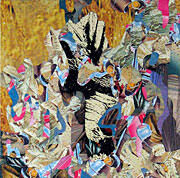 Tony Berlant is renowned for his brilliantly colored and patterned metal collages. Long influenced by the desert environment and a corresponding fascination with southwest Native American traditions and art, his compositions reflect a strong connection with nature. His imagery varies from literal landscapes to near abstractions, all with a sense of place and spirituality. At times sensitive and lyrical, sometimes quirky with a humorous twist, Berlant continues to surprise and delight with his unfailing technique and unique vision. One of his most recent works, Sea Saw, 2009, measuring 42 × 62 inches, draws inspiration from the ocean and has a wildly patterned, stormy sensibility. Other ocean works take on a more soothing rhythm of coastside waves and currents, where the perspective hovers above the water. 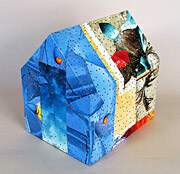 Along with Berlant’s metal paintings will be several three-dimensional house box works. As an artist who is deeply interested in collecting and one who frequently uses the house as a central theme in his work, these small objects become icon-like treasures with their patchwork imagery and comforting solidity. Originally from New York, Berlant received his M.F.A. from the University of California, Los Angeles in 1963. Berlant has been recognized and exhibited widely both nationally and internationally. 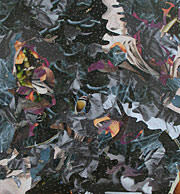 His work can be found in the following selected public collections: Hirshhorn Museum and Sculpture Garden, Smithsonian Institution, Washington, D.C.; Los Angeles County Museum of Art; Museum of Contemporary Art, Los Angeles; Oakland Museum of California; Philadelphia Museum of Art; Phoenix Art Museum; San Francisco Museum of Modern Art; Whitney Museum of American Art, New York; and Yale University Art Gallery, New Haven, Connecticut. Berlant has also created important site-specific public commissions. A notable example, Dancing on the Brink of the World, 1987, is installed at San Francisco International Airport. Berlant created a phenomenal work, Fox, 1997, measuring 36 feet high, commissioned by Twentieth Century Fox Film Corporation, Los Angeles. Additional public commissions include the Junipero Serra State Office Building, Los Angeles, 1999; U.S. Federal Building and Courthouse, Sacramento, 1996; Reagan National Airport, Arlington, Virginia, 1994; and Minneapolis Institute of Arts, 1989–91.